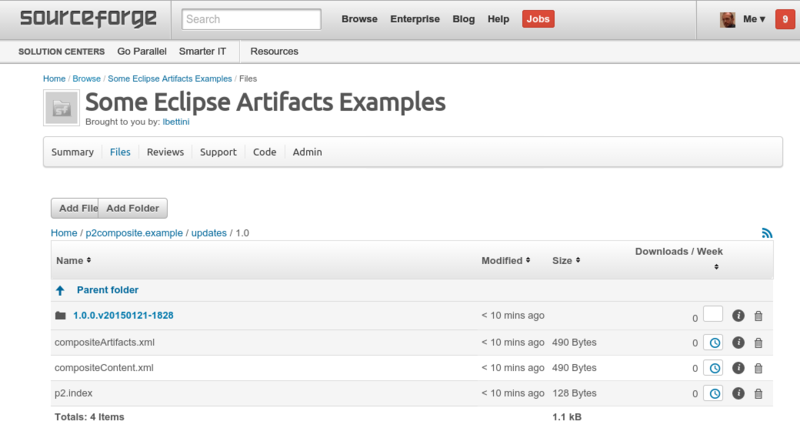 This can be seen as a follow-up post of my previous post on building Eclipse p2 composite repositories. In this blog post I’ll show an automatic way for publishing an Eclipse p2 (composite) repository (a.k.a. update site) on Sourceforge, using rsync for synchronization. You may find online many posts about publishing update sites on Github pages and recently on bintray. (as a reminder, rsync is a one-way synchronization tool, and we assume that the master replica is the one on sourceforge; rysnc, being a synchronization tool, will only transfer the changed files during synchronization). you have download statistics and your artifacts will automatically mirrored in sourceforge’s mirrors. 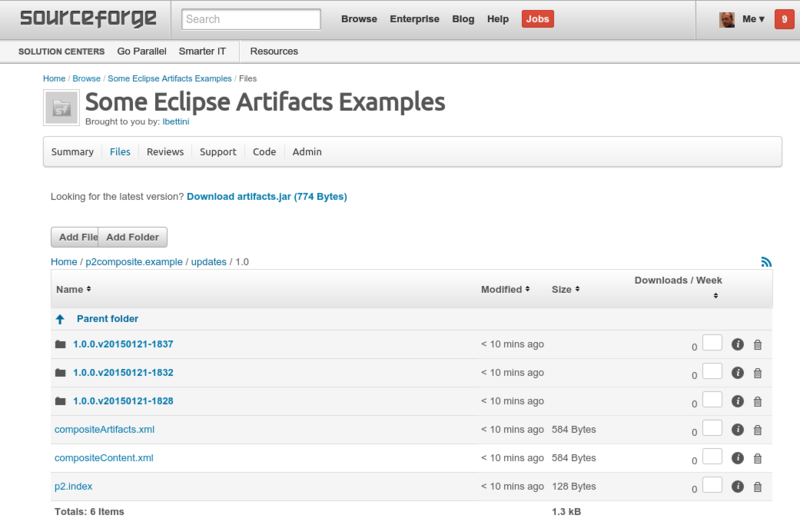 By the way: you can store your git repository anywhere you want, and publish the binaries on sourceforge. (see this page and this other page). I’ll reuse the same example of the previous post, the repository found here https://github.com/LorenzoBettini/p2composite-example, where you find all the mechanisms for creating and updating a p2 composite repository. we can release from any machine, notably from Jenkins or Hudson, since we always make sure to have a synchronized local version of the released p2 composite repository. This assumes that you have an account on Sourceforge, that you have registered a project. You need to create the directory that will host your p2 composite repository in the “Files” section. For this example I created a new project eclipseexamples, https://sourceforge.net/projects/eclipseexamples/, and I plan to store the p2 composite in the sourceforge file system on this path: p2composite.example/updates. I’m using an ant script since it’s easy to call that from Maven, and also manually from the command line. This assumes that you have already rsync installed on your machine (or in the CI server from where you plan to perform releases). This ant file is meant to be completely reusable. We have a macro for invoking rsync with the desired options (have a look at rsync documentation for understanding their meaning, but it should be straightforward to get an idea). In particular, the transfer will be done with ssh, so you must have an ssh key pair, and you must have put the public key on your account on sourceforge. Either you created the key pair without a passphrase (e.g., for releasing from a CI server of your own), or you must make sure you have already unlocked the key pair on your local machine (e.g., with an ssh-agent, or with a keyring, depending on your OS). The arguments source and dest will depend on whether we’re doing an update or a commit (see the two ant targets). If you define the property dryrun as -n then you can simulate the synchronization (both for update and commit); this is important at the beginning to make sure that you synchronize what you really mean to synchronize. Recall that when you perform an update, specifying the wrong local directory might lead to a complete deletion of that directory (the same holds for commit and the remote directory). Moreover, source and destinations URLs in rsync have a different semantics depending on whether they terminate with a slash or not, so make sure you understand them if you need to customize this ant file or to pass special URLs. The properties rsync.remote.dir and rsync.local.dir will be passed from the Tycho build (or from the command line if you call the ant script directly). Once again, please use the dryrun property until you’re sure that you’re synchronizing the right paths (both local and remote). Now we just need to call this ant’s targets appropriately from the Tycho build; I’ll do that in the pom.xml of the project that builds and updates the composite p2 repository. Again, the final / is crucial. Of course, if you want to try it, you need a project on sourceforge and a directory on that project’s Files section (and you’ll have to change the URLs accordingly in the pom file). Let’s say we still haven’t released anything. Now that you have your p2 repository on sourceforge, you only need to give your users the URL to use for installing your features in Eclipse. WARNING: Invalid cookie header: "Set-Cookie: VISITOR=54c382b9c3d3bc3420ac8ac2; expires="Tue, 21-Jan-2025 11:32:09 GMT"; httponly; Max-Age=315360000; Path=/". Unable to parse expires attribute: "Tue, 21-Jan-2025 11:32:09 GMT"
WARNING: Invalid cookie header: "Set-Cookie: VISITOR=54c382b9c3d3bc3420ac8ac2; expires="Tue, 21-Jan-2025 11:32:08 GMT"; httponly; Max-Age=315360000; Path=/". Unable to parse expires attribute: "Tue, 21-Jan-2025 11:32:08 GMT"
But it’s safe to ignore them. You may want to try them both in Eclipse. 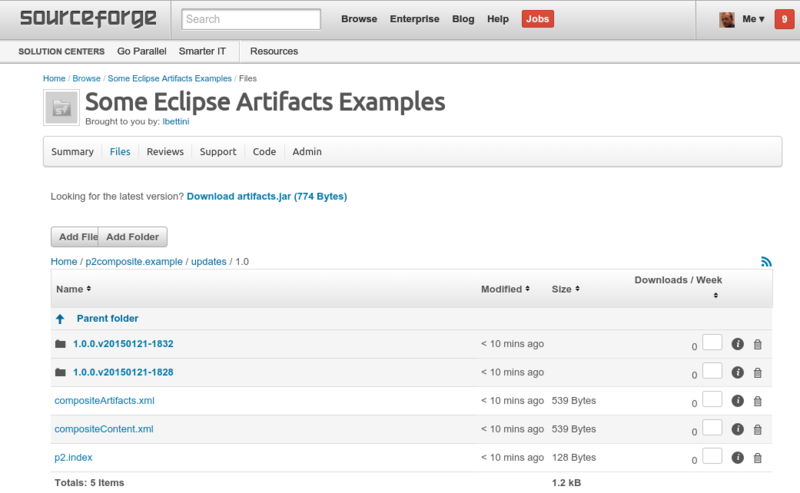 This entry was posted in Tutorials and tagged eclipse, p2, rsync, sourceforge, tycho on January 24, 2015 by Lorenzo Bettini.